Having expensive cabinets hanging on your kitchen walls doesn’t mean much if you don’t like the color. 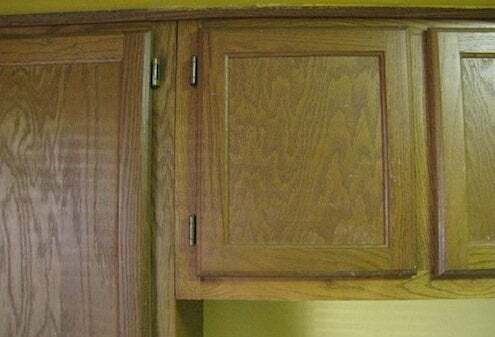 That’s why many homeowners think about refinishing cabinets with a stain color of their own choosing. It is a big job, but there is a big payoff. Before you begin, however, it’s best to do a little detective work. Before embarking, remove one of the doors and sand off a small area of the finish on the back. Do the same to an area at the back of a rail or stile (horizontal or vertical framing member). If you find hardwood, proceed to the next step. If the doors and drawer fronts are fiberboard, forget about refinishing them with stain. The only way you’re going to get the cherry, oak, or birch tones you love so much is by applying a veneer or buying all new doors and drawer fronts. If the doors and drawer fronts are made of hardwood, remove them and take off all the hardware. In a well-ventilated room (or outdoors), use a paint stripper to remove the existing finish. The job is messy and potentially unhealthy, but if you’re careful, it’s better than blowing thousands of dollars on new cabinets. 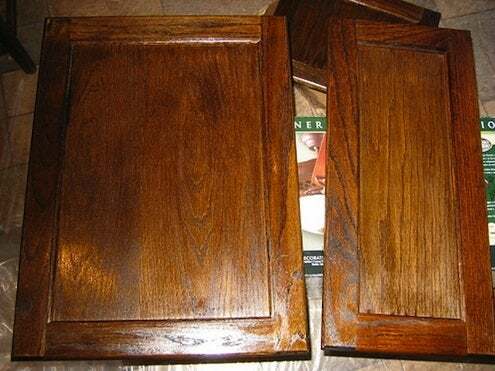 Removing paint from cabinets, or any wood furniture, requires patience. Not all of the paint lifts off after the first application of remover, and maybe not after the second or third, either. It’s imperative to work in a ventilated space, to wear a respirator, to wear protective gloves and a long-sleeve work shirt. Use a sharp scraper to remove as much finish as possible and use whatever you have on hand (old spoons, dental tools, etc.) to scrape contours and crevices. Fill dents and deep scratches with wood filler, then sand thoroughly until all finish is removed and the wood is super smooth with no scratches. Make your first pass with an orbital sander using 100-grit paper, your second with 180-grit paper, and your last pass with 220-grit. Next, apply a sealer (sometimes called a wood conditioner). A sealer does just what it says: It seals the surface with a light, thin coating so that when you apply stain, the color goes on evenly. I prefer Zinsser’s Bull’s Eye Seal Coat, an alcohol-based sealer that’s easy to apply and dries fast. Before applying it, thin out the sealer to 50-50 concentration with denatured alcohol. When the sealer dries, lightly rub with 000 steel wool, then clean the surface thoroughly with a tack cloth. Apply stain using a soft cotton rag, a brush, or a brush in combination with a rag. Experiment until you find a combination that allows you to apply a consistent tone. If the stain is going on too dark, rub some off. Too light? Don’t worry. You can apply another coat after the first one dries. Once the stain has dried, follow up with another very light rubbing with 000 or 0000 steel wool before cleaning with tack cloth. Now you can apply a protective coat of clear polyurethane varnish. Applying any clear coat must be done in a dust-free environment. Read the directions on the can and follow them, but when it comes to thinning, you may need to deviate from the product literature. Most makers say you won’t have to, and maybe that is the case under perfect conditions, but I find that it’s usually necessary to pour in a little mineral spirits to keep the polyurethane flowing smoothly and drying without brush marks. If you want a darker tone than the one you currently have, you may be able to simply tint the existing finish. Begin by thoroughly washing grease and wax off the cabinets with TSP and water. Next, lightly sand and wipe off the dust with a tack cloth. Now experiment with a tinted polyurethane varnish (such as Polyshades by Minwax) to see if you can achieve the tone you desire. Tinted polyurethanes combine stain and varnish in a single product. If you want a lighter tone, remove the clear coat finish using the same method as described for paint. It should be a lot easier than removing paint, but you may have to use an aggressive stripper or chlorine bleach to remove the old stain. Follow up with sanding, sealing, re-staining and clear-coating as described above for staining a previously painted finish. It’s always wise to experiment on the back side of a single door before committing to the project, just to be sure you’re going to be pleased with the results.